There are several transportation options to get to the strip from McCarran Airport in Las Vegas. With the cab vs. Uber/Lyft debate, now there are more options than ever for those traveling to the Las Vegas area. So which is the cheapest, most reliable, fastest service, and the best for larger groups? Read below as we breakdown the different choices for getting to the strip from the airport. Like most other places, taking a taxi in Las Vegas is a viable option from getting you from point A to point B. Instead of hailing a cab like you would in New York City, when arriving at McCarran International Airport, there are curbside taxi lines organized by airport attendants who expedite taxi pickup. There are many different cab companies to choose from and there’s not much difference between one company over another. Generally, the base prices are consistent among taxi competitors. In recent years, Las Vegas taxis have been exposed for exploiting Las Vegas’ tourists long before they get a chance to hit the slot machines. Taxis undoubtedly have gotten a bad rap for hustling miles and penny-pinching fares; but to say they are all out there to rip off the unsuspecting tourist wouldn’t be fair. The cost of taking a taxi costs around $17 to hotels located on the Las Vegas strip. The cost will vary based upon on the location of your hotel and how busy the traffic is. Remember to mention to take the shortest route to your hotel. Utilizing navigation apps such as Waze allows you to know the fastest route and also ensures you won’t get swindled. You do not want to be stuck in the infamous taxi tunnel; only to then hop on the freeway, and winding up with a whopping $25 fare. This loop is essentially the long way to get anywhere. Be in the know and be sure to report a driver if they take the tunnel unnecessarily. Taxicabs are available on the east side of baggage claim, outside door exits 1 – 4. Is is customary to tip the taxi driver about 15% of the cab fare. From the airport to the strip about $3 or so will be fine. Over the last year, Las Vegas finally welcomed rideshare options already implemented in thriving metropolises such as Los Angeles, New York, Chicago and Seattle. It wasn’t an easy task to bring these alternatives to a city where taxicabs hold the monopoly and have the reputation for being a crooked militia. Finally, tourists without shoveling out money on a rental car have better options…but to what extent? Getting a ride from either Uber or Lyft is simple. If you have a smart phone with a data plan and an email, you can easily use either app to have a driver arrive within seconds to a few minutes. Waiting in line for a taxi can take anywhere between 10 minutes to 45 depending on what events are happening. During convention season, which runs between January and May, tourists used to be at the mercy of a taxicab driver and cabbies got away with exploiting many an unsuspecting passenger. With the advent rise of the rideshare system, passengers are taking the power back. Cash transactions are the primary means for paying for a taxi. With a hefty $3.00 additional charge to use a debit or credit card, taxicab companies have been making out quite nicely. One of the most appealing aspects of using a rideshare is that cash is never exchanged. Everything is done through the app. Lyft and Uber users alike, enter either their debit/credit card information or provide their Paypal upon initial app setup. Another aspect ensuring quality to the app user for both Lyft and Uber is that they have incorporated a form of checks and balances as passengers may rate their driver on a star scale of 1-5. This is incentive for drivers to provide the highest standard of service since if they fall below a specific rating, they will lose their job. All rideshare drivers have passed an extensive background check and when they arrive, their personal information including their picture and a brief bio appear so you know who you’ll be getting in the car with. You also have the choice to cancel the ride if the driver doesn’t seem like your cup of tea. With a taxi, you don’t know whom you’re getting a ride from until they show up to toss your bags into the trunk. Rideshare employees use their own vehicles and each vehicle must pass a rigorous inspection. As they are using their own cars to provide service to customers, Uber and Lyft cars are kept in immaculate condition. Some cars offer complimentary water, candy, gum, and snacks. When choosing between Uber and Lyft, both offer similar services, but base fares between the two vary. Although a typical taxi ride should cost about $17 from terminal 1 to Caesar’s Palace, the price tends to be closer to $20. Tack on the $3.00 credit card fee and the unnecessary trip through the infamous tunnel (a well-known shady practice by many unethical cab drivers) and you’ll be looking at upwards of $25-$35 for a few mile trip. The same trip taken using Uber ranges from a base fare between $13-17 and with $8-13 using Lyft. Currently, In Las Vegas, Uber passengers can choose from Uber X, Uber XL, and Uber Select. Uber X charges a $1.50 base fare, $1.70 booking fee, $0.15 a minute and $0.90 per mile. The minimum fare for Uber X is $5.00. This is the cheapest option and includes cars that can accommodate 4 riders. Uber XL charges a $3.25 base fare, $1.70 booking fee, $0.35 per minute, and $2.25 per mile. The minimum fare for Uber XL is $7. Slightly more expensive, Uber XL is the best option for larger parties of up to 6 passengers. Uber Select charges a $5 base fare, $1.70 booking fee, $ 0.40 minute, $3.00 a mile with an $8 minimum fare. Uber Select offers passengers to ride in style. Vehicles that qualify for Select are sharp, higher end cars, and are generally black on black. Uber Select will be replaced by Uber LUX later this week and will include extravagant cars that scream Vegas. Ordering an Uber LUX will be a true experience as passengers cruise to their destination in cars like Mercedes Benz and Porsches. In addition to the Las Vegas Uber family, the Uber LUX SUV option is also said to be implemented as another choice for Vegas riders. Much like the flashy vehicles of Uber LUX, with LUX SUV, passengers can arrive to their destination via Cadillac Escalade, Chevy Suburban, Audi Q6, Porsche Cheyenne, and a host of other supremely decked out sport utility vehicles. If this sounds more enticing than a taxi, it should. When comparing taxis to rideshares, we’re comparing the cheapest option for both Uber and Lyft. A word of caution: although the basic Uber X and Lyft car are far cheaper than a taxi, there are exceptions. During times of high demand, Lyft and Uber charge more than their base fare. Uber refers to high demand as surge pricing and Lyft calls it primetime. If there are more passengers than drivers, prices increase for both rideshare options; however Uber’s surge pricing can be worse than any taxi driver taking you for a ride. Using Uber during a surge can be a rip-off. The app will indicate how many times more expensive the ride will be during a surge. In situations like these, a ride that should cost about $12 from the airport to the Las Vegas strip can easily turn into a $120 fare if surge pricing is 10 times its normal price. Be aware of using Uber during a surge. This is the time you may want to stand in line and wait for a taxi. With Lyft’s primetime pricing, fares will generally increase between 25-200%. If you are aware of how much a base fare will cost you, you can calculate if the ride is worth it. Lyft makes it a point not to overly exploit passengers during times of high demand. There will be a marginal increase to entice Lyft drivers who aren’t in the immediate area to migrate toward the high demand area, but generally the trade off for a Lyft driver showing up quickly makes up for the few extra bucks. Check online for rideshare promotions. Uber and Lyft run monthly promotions for new sign-ups. If you haven’t downloaded the Lyft app, enter the code DESERTSNOW or VEGASWIN777 to receive $5 off your first 10 trips. Neither Lyft nor Uber require you to tip your driver; however a recent news report on Fox 5 demonstrated that although it’s not expected, it is certainly appreciated. Uber does not offer an in-app electronic tip option, but if you have a few dollars, Uber drivers certainly accept it. As fares are substantially cheaper 90% of the time than taxi rides, what the average Uber driver makes isn’t anything to write home about. Drivers are incurring wear and tear on their personal vehicles unlike taxi cab drivers. Lyft’s app allows the option to tip a driver for exemplary service after the ride has been completed. Unlike a taxi driver who seems to stand there with his/her hand out waiting for gratuity, neither Uber or Lyft drivers expect to be tipped which makes them possibly more deserving of one. Terminal 1 pickup: Located in the parking structure on level 2M. Designated rideshare pickup areas are marked. Terminal 2 pickup: Located in the parking structure on V Level (Valet Level) This area is also well marked, but if you get confused, just contact your rideshare driver. They will direct you where to go. It’s a slightly longer walk to rideshare pickup areas vs. cab pickup, but you will likely arrive at your rideshare driver minutes sooner than getting to the front of the cab line. Uber, Lyft, and taxis all drop off curbside at your designated airline, making your trip home as smooth as possible. Shuttles are the cheapest way to the strip but the slowest option to get your las vegas hotel. There usually is a wait, as much as an hour, for the shuttle and it will make multiple stops along the way to your hotel. Recommendation: Most people try to avoid shuttles and usually vote against it, so I would just take a taxi instead. If you by yourself it will save you money however. Limos are a great means of transportation if you are looking to travel VIP style, impress your wife or date, or traveling with a group of people. The size of limo depends on the amount of people you are traveling with. The smallest limos fit about 6 people depending on luggage so it might be almost as cheap as getting two limos for your group. The great thing about limo service is there is no waiting, you can make a stop along the way to your hotel, and it makes a great start to your vacation. A Towncar or SUV is a great choice if you want to avoid the taxi line and have a more comfortable ride to your hotel on the strip. 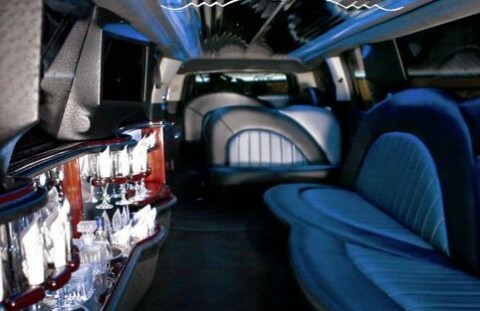 It is also less expensive than a limo but still offers the same type of service. You can reserve your lomo in advance or get one when you arrive. There should not be more than a 5 minute wait if you just walk up and get a limo, Towncar, or SUV when you arrive. Limousines are available on the west side of baggage claim, outside door exits 7 – 12. At Terminal 3, shuttles and limousines are conveniently located outside on Level Zero on the west end of the building to serve domestic travelers and on the east side of the building to accommodate international travelers. 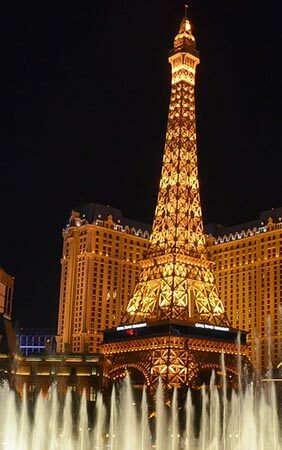 Rental car is another option to get to the strip, although if you are not planning on leaving the strip it is probably not the best option. You will not need a car if you are planning on staying on the strip or even visiting a few places off the strip. Take a cab, walk, or ride a bus on the strip instead of driving. The strip can be so packed with traffic and parking can be a pain, you will not want to deal with it. If you do plan on day trips or other off strip excursions than a rental car might be the way to go. The McCarran Rent-A-Car Center is located at 7135 Gilespie Street, just three miles from the airport with easy freeway access to Interstates 15 and 215 and the Las Vegas Strip. Arriving car rental customers will be transported to their vehicles by dedicated blue-and-white McCarran Rent-A-Car Center shuttles for the three-mile trip to the Center and the car rental company of your choice. From Baggage Claim, follow signs to Ground Transportation on Level 1. 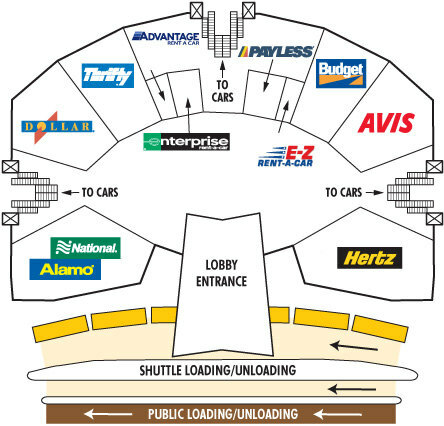 Proceed to the Rental Car Shuttle located at the center median outside doors 10 and 11. Blue and white McCarran Rent-A-Car Center shuttle buses depart approximately every five minutes for the three-mile trip to the Center and the car rental company of your choice. Follow signs to Ground Transportation from Baggage Claim on Level Zero. Proceed to the Rental Car Shuttle located outside West doors 1-4 and East doors 5-8.